Scotland's pro-independence parties, including the SNP and the Greens, have reported a surge in membership in the wake of the referendum "No" vote. 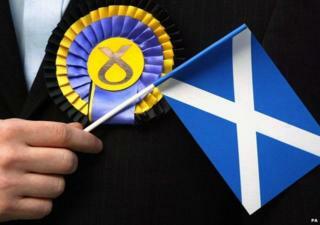 The SNP now has more than 42,000 members compared with 25,642 at 17:00 on Thursday, the party said. The Greens also said thousands joined their party over the weekend. The figures came as Labour said it would reach out to supporters who voted for independence in last Thursday's vote on Scotland's future. SNP Business Convener Derek Mackay, said: "Scotland's referendum was an incredible triumph of democracy - and the new wave of democratic engagement and activism the 'Yes' campaign inspired shows no signs of stopping. "That nearly 17,000 new members have joined the SNP in the last few days - taking the party's membership to over 42,000 - is incredibly encouraging and confirms that it is the SNP that the people of Scotland trust to work in Scotland's best interests." The SNP and Greens, as well as the pro-independence Scottish Socialist Party said they had recruited many former Labour members. Scottish Green membership has now passed the 5,000 mark, said the party, with more than 3,000 new members signing up since voting in the referendum closed on Thursday night. Green co-leader Patrick Harvie, said: "I want to thank the vast number of people who have been in touch over recent days to offer support, share their thoughts about the Green 'Yes' campaign, and to join the party in their thousands - including those who voted 'Yes' and 'No'. "We'll be going into the next election as a much bigger party than we could have imagined, and the potential clearly still exists for a dramatic realignment of Scotland's political landscape."